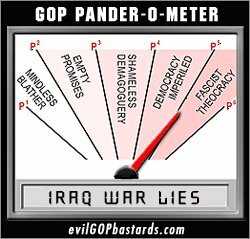 Note: This panderometer seems to be set about a decibel too high, but it is the best I could find, what with the heavy demand these last few months. The guys at Radio Shack tell me the new, improved models won't be in until next week, which means I can pick one up when I go in to get the parts for the giant robot I'm building. The robot's going to look like Theodor Adorno. Well, like Theodor Adorno if he were thirty feet tall, had laser eyes, and the ability to crush cars with his magneto-grip (which he didn't have -- everybody knows that was Herbert Marcuse). But what, you ask, prompted me to fire up the panderometer in the first place? An excellent question! I mean, whenever I plug that sucker in I risk blowing a fuse, especially if I do so while running the hair dryer. So I use it only under dire circumstances. But circumstances are, of late, somehwat dire. Newsweek's Howard Fineman tells us George Bush has a new story to tell, now that his old talking points are looking a little threadbare. The new White House talking points can be encapsulated, Fineman says, with a handy acroynm, WATITH -- the War Against Terrorists Inside The Homeland. And who are these enemies in the homeland? As Fineman puts it, they are "not just the terrorists themselves, but also wussie lovers of legalistic niceties that get in the way of investigations..." In this new story, it seems that those who don't toe the line and agree that Bush's law-breaking acts of surveillance on American citizens are both hunky and dorey are no better than terrorists. ...the people can always be brought to the bidding of the leaders. That is easy. All you have to do is tell them they are being attacked and denounce the pacifists for lack of patriotism and exposing the country to danger. That was from an interview with Herman Goering. No, I'm not making this up. Nor am I saying that Bush is a Nazi. But it is fact, not opinion, that he's not above considering a tactic Goering embraced, nor above using it for similar ends. And we're not wrong to be appalled. If this keeps up, I suppose I'll be seeing you all in Gitmo. But don't worry: my giant robot will set us free.